Fractions are SCAREY to left brained kids (or visual learners as I call them). But...if you can convince them that they are really MAGIC tricks, math and algebra can be FUN. For example, when you want to eliminate a fraction--or magically make it disappear--just invert it. I tell the kids, "Just stand it on its head and make it multiply." Use the example of the fraction 4. If you stand it on its head or invert it, you end up with 8. Tell the kids that the multiplication sign is like the magician's magic wand. They can cross multiply and cancel the fours, then cross mulitply again and cross out the eights, resulting in the single RABBIT named ONE. In an algebraic equation this concept comes in really handy. Remind the students that when solving an equation, make sure the variables remain on the left hand side of the equation. 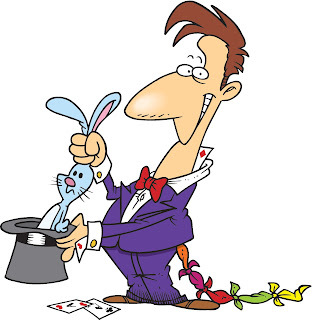 (See my Tagalong blog,) Remind the students that whatever the magician does to one side of an equation, he must do the same thing to the other side of the equation. Using the new trick, invert the fraction and multiply on both sides of the equation. The inverted fraction multiplied by 3/5 results in 1x. Always place a whole number over one to make it a fraction. You can explain cross canelling here, or leave it as it is in step three. Step three: multiply right side of the equation.